This wooden box sign says "I pray that you know how long, how high, and how deep is the love of Jesus". There is a little resin sheep on the top. This measures 7 x 8 x 1. 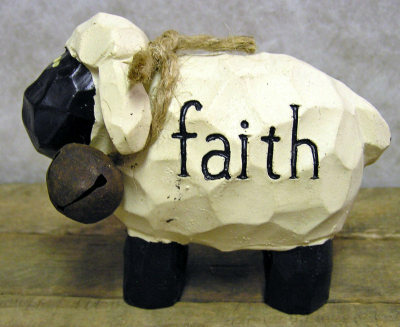 These resin sheep come in three styles: "faith" (shown), "family", and "friends" (click on photo to see these styles). 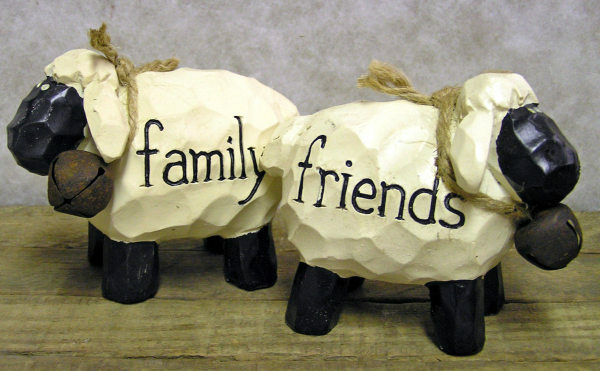 They have a jute collar with a rusty tin bell on it and the words are engraved on their woolly side. They have a black face and legs. They measure 3 X 4 X 2. 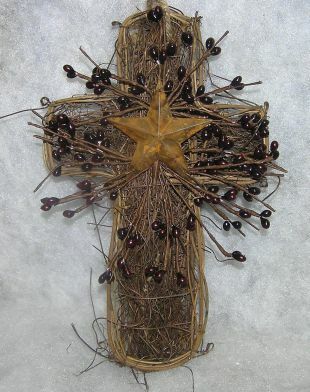 This unique wooden twig cross comes in three styles: maroon berries (shown), white berries, maroon/white/green berries (click on photo to see these last two options). 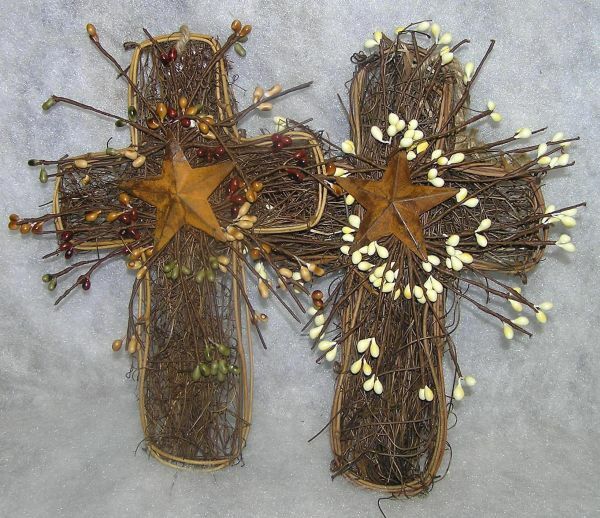 It also has a rusty tin star and jute hanger. It measures 9 x 6 x 1 1/2. This unique wooden box sign has a tree with hand painted red birds in it. 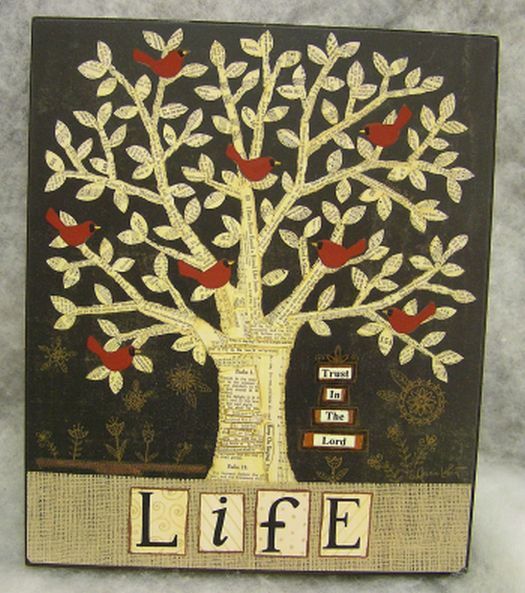 It says "Life" on the bottom and "Trust in the Lord" under the tree. It measures 9 1/2 x 8 x 1 1/2. 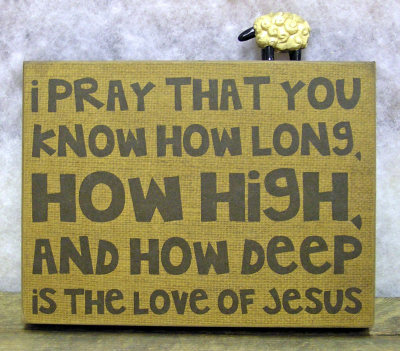 This canvas print says "JESUS CHRIST PRINCE OF PEACE" on it. It has a red and green designed background. It measures 10 c 12 x 3/4. 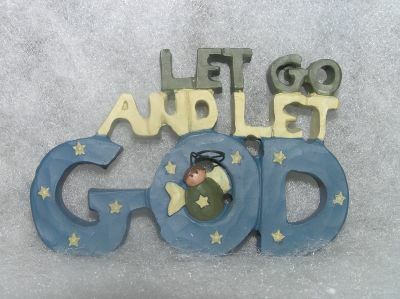 "LET GO AND LET GOD" are spelled out in these resin letters. A little angel with wire halo is peeking out of the "O" in GOD. It measures 2 x 3 3/4 x 1/2. 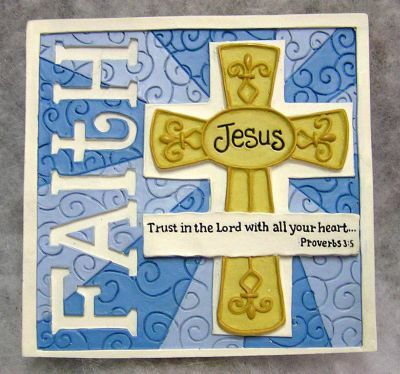 "BE STRONG AND COURAGEOUS, DO NOT BE AFRAID OR TREMBLE AT THEM, FOR THE LORD YOUR GOD IS...the One that goes with you....HE WILL NOT FAIL YOU OR FORSAKE YOU. 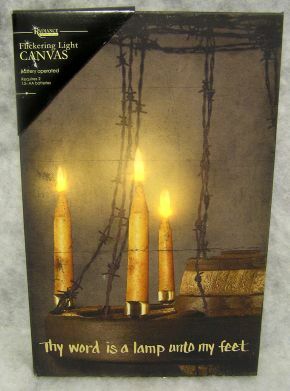 DEUTERONOMY 31:6" is the verse that is printed on this canvas. It has a colorful flower background. It measures 11 x 14 x 3/4. 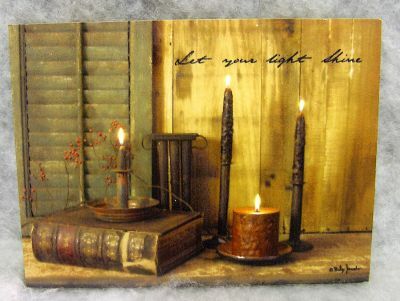 This print is mounted on a wooden block, It has a rustic scene of candles, an old book, and says "Let your light Shine". It measures 6 x 8 x 3/4. This canvas sign features a candle that is lighted and has greens around it. 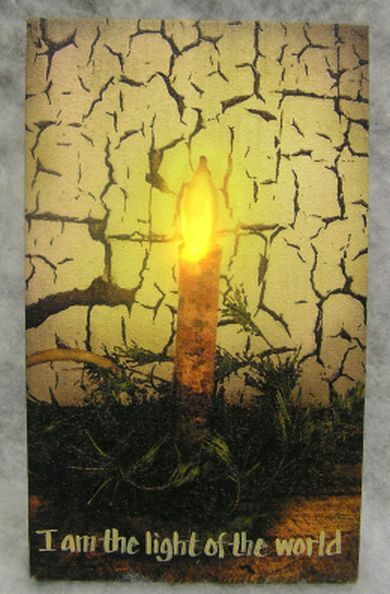 There is a crackle background. "I am the light of the world" is hand painted at the bottom and the candle is lighted with 2 AA batteries. It measures 10 x 6 x 1. 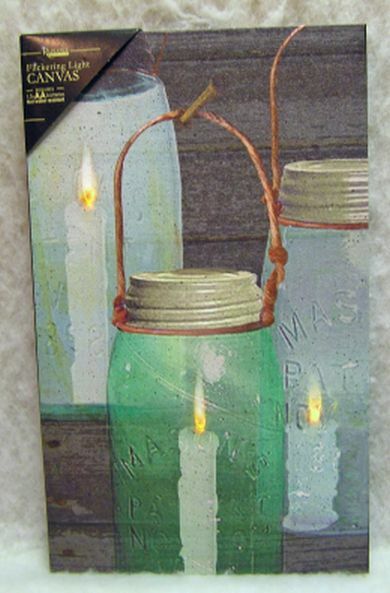 This canvas sign has "Thy word is a lamp unto my feet" hand painted on the bottom. It has several candles that are lighted using 2 AA batteries. It measures 12 x 8 x 1. "For God so loved the world He gave his only begotten Son...John 3:16" is on the front of this resin sign. 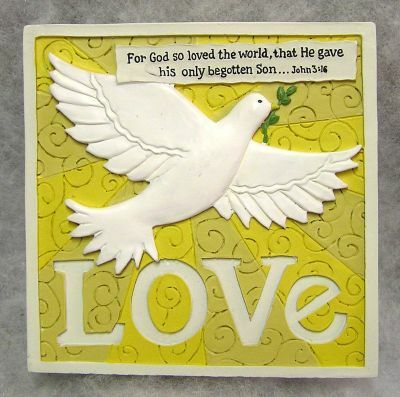 There is a white dove and the word "LOVE" at the bottom. It has a stand on the back. It measures 4 x 4 x 1. "Trust in the Lord with all your heart...Proverbs 3:5,6" is on the front of this resin sign. 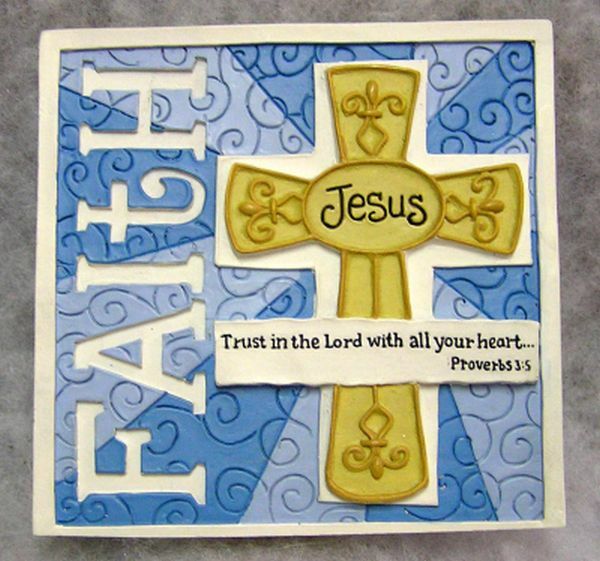 It has "FAITH" along the side and a cross with JESUS in the center. It has a stand on the back. 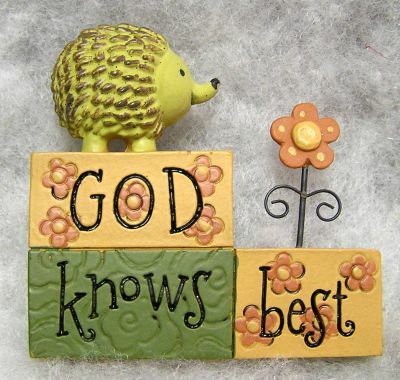 This cute little hedgehog is sitting on top of a resin sign that says "GOD knows best". 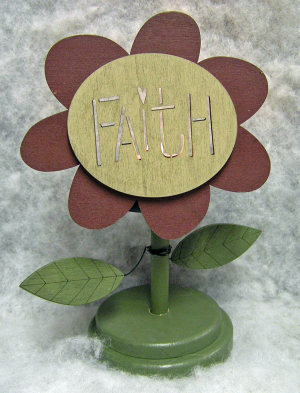 It also has a flower on top of a wire stem. It measures 2 1/2 x 2 1/2 x 3/4. 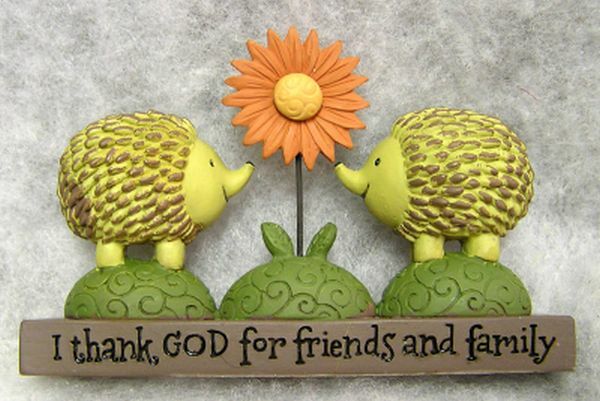 These two resin hedgehogs are standing on grassy mounds with a flower in between them. "I thank GOD for friends and family" is engraved along the bottom. It measures 3 x 4 1/2 x 3/4.